Social media can do more than just amplify the reach of your cross-channel marketing campaigns… it can drive instant conversion. By using social media as the Point-of-Conversion for cross-channel campaigns, you can enable consumers to respond, participate and purchase - anywhere they see your advertising. Join as we share case studies and best practices from innovative brands using Twitter, Facebook and Instagram to capture instant conversion from advertising at live events, in-store and on TV. Brands have invested significantly in their social content and audience development – and many are now looking to drive meaningful new customer acquisition and conversion via social as well. In this session, we’ll be sharing some of our most successful programs – along with best practices for maximizing social marketing conversion. Thought leadership to help activate your next marketing campaign. We work with brands, agencies and networks who want to leverage social as the point of conversion for their multi-channel marketing campaigns. 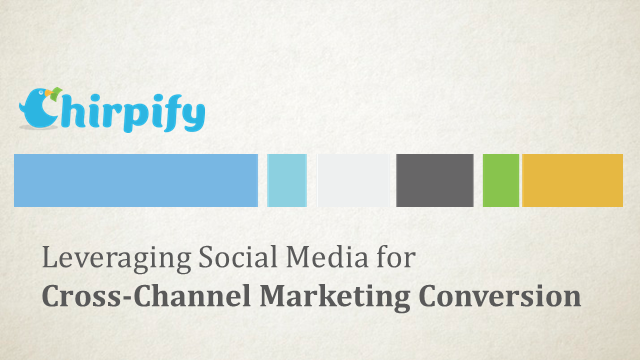 Join our channel to learn how you can build the future of social conversion and commerce.